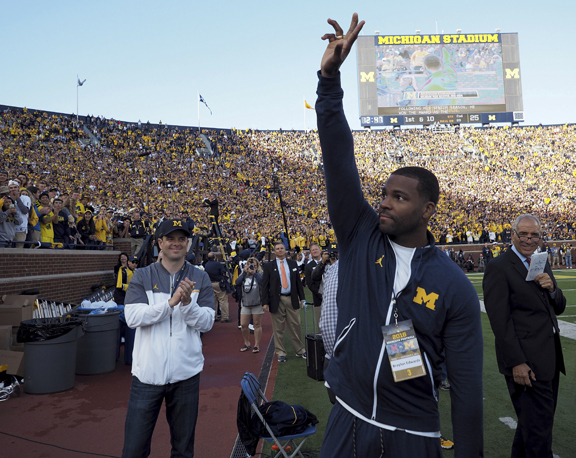 ANN ARBOR — The war of words between Michigan coach Jim Harbaugh and former Wolverines receiver Braylon Edwards is heating up. Harbaugh, upset Edwards posted a negative tweet about two U-M players during Saturday’s 24-17 loss at Notre Dame, fired back at Monday’s news conference. Edwards’ tweet Saturday night, which was later deleted, was directed at U-M center Cesar Ruiz and transfer quarterback Shea Patterson: “Ruiz is weak, line is weak, shea is scared, (expletive) Michigan offense is so predictable…..Michigan football is sadly one thing……Trash,” Edwards wrote. On Monday, Harbaugh defended his players, both first-year starters for the Wolverines. “First of all, it’s not true. It’s not factual,” Harbaugh said.